Outside Schwerin, in an old cemetery, you find a remarkable monument. It is raised as a memorial to Hofbaumeister Georg Aldolph Demmler, the architect of the Dukes of Mecklenburg-Vorpommern. 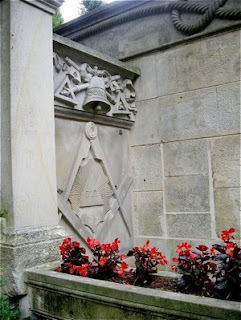 It is remarkable, as it is one of the largest Masonic graves in Europe. 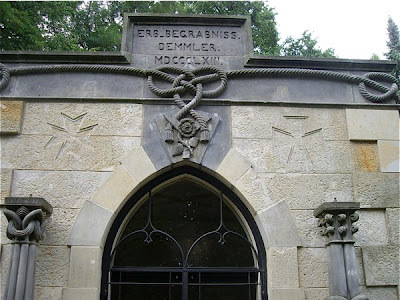 Georg Adolph Demmler was a prominent Freemason, and donated a house for the masonic lodge in Schwerin. The Lodge Harpokratus zur Morgenröthe was founded as far back as 1809. This house is located close to the Schweriner Dom. The most famous monument of Hofbaumeiser Georg Adolph Demmler is the Palace in Schwerin, the home of the Dukes of Mecklenburg-Vorpommern. He designed several other buildings in and around Schwerin, as the Arsenal am Pfaffenteig and the City Hall. The last memorial to him was designed as a tribute to the organization that meant so much to him. It is strange to see a monument so different from the others. It is really a different sight to see when visiting Schwerin.